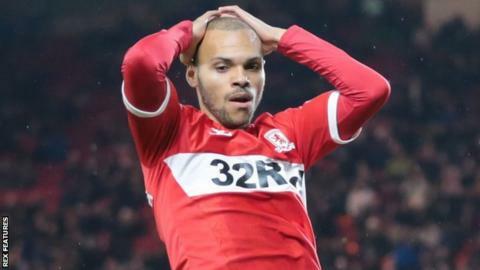 Middlesbrough's Martin Braithwaite has joined Spanish club Leganes on loan until the end of the season. The 27-year-old Denmark forward has not scored for Boro since asking to leave the club at the end of August. It is the second time Braithwaite has left Boro on loan since joining them in July 2017, having spent the second half of last season at French club Bordeaux. "He wanted to go in the summer. He has got his move now," manager Tony Pulis said after Tuesday's game at Derby. Leganes previously tried to sign Braithwaite before the end of the summer transfer window and Braithwaite travelled to Spain earlier this week for talks.